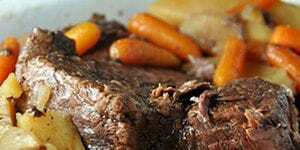 The Perfect Crock Pot Roast really is my Momma’s recipe that I grew up on. I have tried TONS of roast recipes, and even though I have tried some pretty fantastic recipes, this has always been my favorite. UPDATED with a video from Mikey from our cooking show. As I have said before, I grew up in a meat and potatoes family. One of my favorite recipes that momma would make is The Perfect Crock Pot Roast. I am not much on carrots, but Michael loves them, so it works well. He fights me for the potatoes but usually lets me win. When I first went to college, I did alright. I didn’t get too homesick…until I came home that is. Then it was SO hard to leave! On many occasions, Momma would send her famous (at least to me) The Perfect Crock Pot Roast back with me to college. An entire roast just for me! I was the envy of everyone on my floor! Fast forward to when I am trying to learn to cook to feed my family. I knew I wanted to make this amazing roast for my loves and was pleasantly surprised to find out that it is crazy easy! We used brown gravy mix in this recipe. I made up The Perfect Crock Pot Roast in good ol’ Sir Hamilton (my Hamilton Beach Programmable Insulated Slow Cooker). Your favorite 5-6 quart slow cooker will work great as well. If you are having trouble watching this video, you can watch it here on youtube. 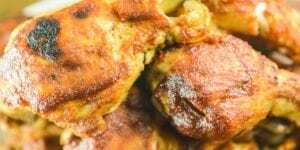 This is a tried and true roast recipe that I have enjoyed since my childhood! Cover again for the last hour of cooking. I made up The Perfect Crock Pot Roast in good ol' Sir Hamilton (my Hamilton Beach Programmable Insulated Slow Cooker). Your favorite 5-6 quart slow cooker will work great as well. Can you cook it for 7 hrs on low? It will depend on the size of your roast and how hot your crock pot cooks. Be sure and check it with a meat thermometer. Enjoy! Would a Top Round Roast work? Also, what do you do with the meat once it’s finished? Shred? Chop up? As for how to serve it, it is usually fall-apart tender, so chopped/sliced is perfect. Enjoy! I love this recipe! This is pretty much how I make my crock pot roast but instead of using the water with the brown gravy packet, i mix the brown gravy mix with a can of beef broth. It makes such a rich, flavorable gravy that is really sooo good! Oh yum! I can’t wait to try it that way! Made this three times already, loved it every time. We also marinated the roast the night before with steak dry rub and some liquid smoke marinade for extra flavor, as well as a couple teaspoons of garlic poweder sprinkled on top before piling on the veggies and potatoes. Great recipe. I’m so glad you love it! And I love the alterations you made to the recipe. One of my favorite things to do is take a recipe and make it my own! 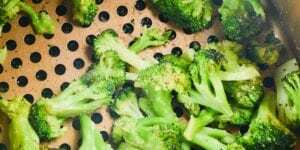 Can you cook on high for half the time? I haven’t tried it on high. If you do, you will want to go with a roast that is tender. Cooking it low and slow is what makes the meat so tender (even on the not-so-tender roasts). If you give it a try, let me know what kind of roast you used and how it turned out! Enjoy! Well I was Just about to head to HEB (after getting my 4yo ready at 8am on the weekend) just for a pack of pot roast mix. But being that I like my only day off on Sunday to be lazy my Pinterest brain kicked in and I decided to check for an alternate liquid to use. 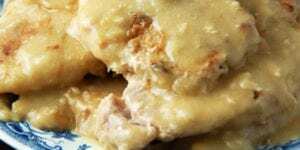 Yall came up and made this look great and Since I’m stocked on brown gravy mix I’ll be be giving this a try today come 10:30am! Kudos to you for having your 4 year old ready to go out the door at 8:00 am on a weekend! (I have a 4 year old and 2 year old, so I know what a struggle that can be!) I’m so glad you were able to get some cuddles and cartoons in with your little one! This is Momma’s recipe. It has been tried over and over and proved itself to be amazing! I hope you enjoy it as much as I have all my life! How much time do I add if my roast is just over 3.5 lbs? I would think that you would probably want to try cooking it for 8-10 hours. 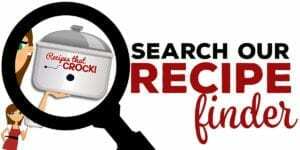 As always, you will want to try it the first time when you can watch it so you know how your specific slow cooker cooks it (cook times can vary greatly between different brands and models). I hope you enjoy this as much as we do! I accidentally closed the pop-up window for the weekly emails & now I can’t figure out how to sign up for them. I usually use russet potatoes since they are harder and can hold up in the longer cooking time. Enjoy! Hey I’m new at this whole cooking thing. 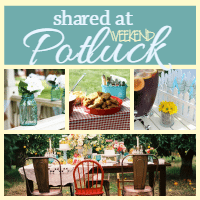 I am loving this crock-pot cooking ideal. So does thawed meat work better than frozen. I know chicken works both ways but branching out to beef is kinda scary. Help!?! 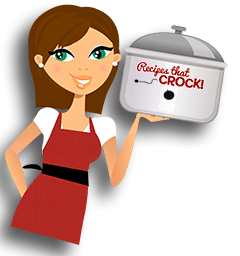 Welcome to the world of crock pot cooking! You are going to love it! I have never tried this recipe with a frozen roast. I would say a thawed roast is best since it already has a long cooking time. If you have any other questions along the way, we’re here to help! Enjoy! I started this a little late today and want it to be ready before church tonight. Is it possible to shorten the cooking time by a couple of hours by starting off on high and then dropping it down to low? I have not tried that before, but it could work. If you try it, let me know how it turns out and what timing you used. Enjoy! As a first time pot roast cook, I’m curious, does this make an actual gravy? It is a thinner gravy. Adding in the second packet of gravy mix does thicken it up a bit, but it isn’t a super thick gravy. Enjoy! 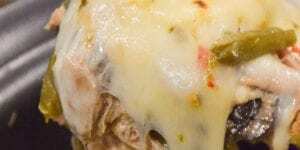 Hi there…Have you ever used a Sirloin Tip Roast? Just wondering, they are on sale at my local store! I would like to know if you have good results with a Sirloin Tip Roast? I have not tried this with a Sirloin Tip Roast, but I have done this recipe with various roasts and have had great success. If you give it a try, let me know how it turns out! Enjoy! The potatoes and carrots are definitely fork tender, but they aren’t too mushy. I use russet potatoes since they are a harder potato. I hope you enjoy this as much as we do! Been making this for year, it is a great dish, I use beef broth, but will try it with the brown gravy mix, sounds like it could an improvement to mine. We love it! I hope you enjoy it as much as we do! The gravy is ah-mazing! I’m so glad you enjoyed it! It is a long-time family favorite around here! I am a frugal shopper, so when I buy a roast, I usually find the cheapest per pound roast I can. This time around it was a chuck roast. I have also made this with a round roast. That is the great thing about this recipe! It works great with cheap cuts of meat as well as the expensive ones. 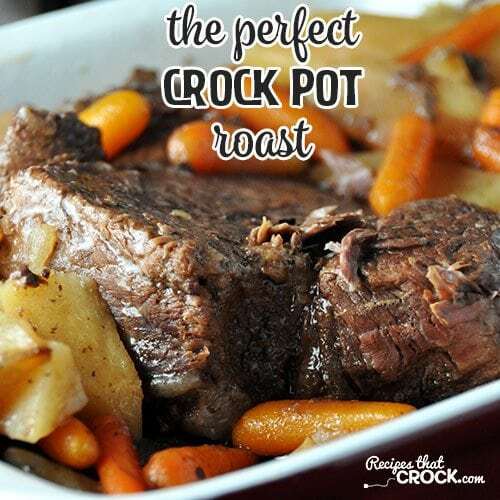 The crock pot does all the work making it into a juicy, tender, flavorful roast! I hope you enjoy this as much as my family has over the years! Thanks for the reply. I appreciate it. I most often opt for a chuck roast for slow cooker recipes and I think that will be the case, here, as well. Thanks again. I asked mom about browning the roast before I made it this time. She said sometimes she does and sometimes she doesn’t (like most of momma’s recipes, there is lots of room for doing what you want!). I actually did not brown my roast this time. This recipe browns up the roast nicely without doing it before, but you can brown it if you want! Enjoy! This looks yummie. One of my all time favorite comfort foods is roast beef. Even though I am 76 years old I still miss my mom’s roast beef. She would use red wine and soy sauce so this is what I would do in place of the water. Thank you so much! Does this work with a pork roast as well, or do you have another recipe you’d recommend? Yes, this would work with a pork roast or you could try our Crock Pot Pork Roast and Veggies. Enjoy! You recently put out a cheesy sauce that you served w/crackers…I don’t recall the name of it. Why couldn’t you do it w/wings? Give it a try and let us know how it is! Enjoy!